These are the details that our Authors & Publishers will need to know about the event. We’ll also send out emails with any changes or additional details as the event gets closer. This is the Frauenthal Center, 425 West Western Ave., Muskegon, MI 49440. It’s an excellent facility for us, and we’ll be in an air-conditioned lobby. 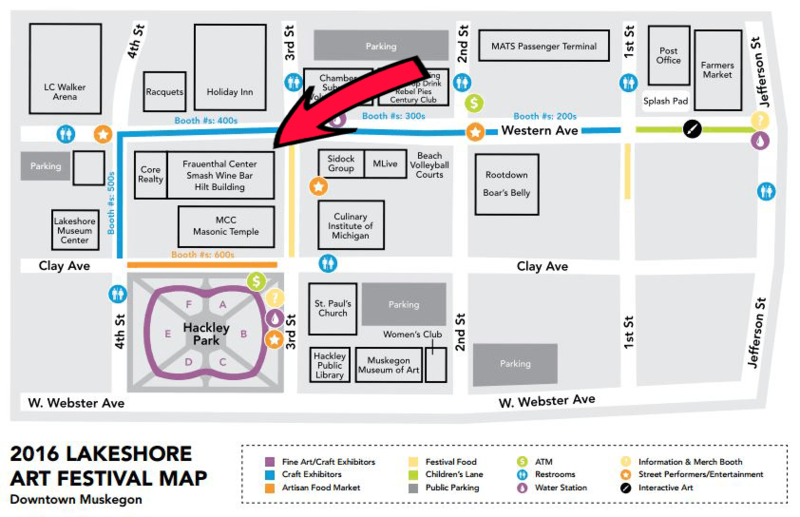 You can see the Frauenthal location on the Lakeshore Art Festival Map (click map for large image). The Frauenthal Center is indicated by the red arrow that points to the main entrance. The main traffic of the art fair runs along Western Avenue and 3th Street, passing on both sides of the Frauenthal (see the colored route on the map). Setup: begins at 9:00 AM. It must be complete by 10:00. Each half-table will be numbered. Table assignments will be given upon arrival. Please arrive promptly at 9:00 AM. Tables are 6′ x 2.5′, so if you have a half-table, you will have a 3′ section. One chair will be provided for each 3′ section. (More than one person per half-table is not recommended.) We will provide table cloths for the tables (they will be either red, white, or blue). We will have volunteers to assist you as needed. You will not be able to get to the Frauenthal with your vehicle because parking is restricted during the Art Fair. You will have to park in one of the nearby parking lots and schlep your materials to the Frauenthal. Please see the map above for nearby parking spots. Orientation: On Friday, at 9:40 AM, we will review events and plans for the day. At 6:15 pm Friday evening (as soon as customers clear out) we will invite comments or recommendations for Saturday. On Saturday at 9:40 AM, we will orient new authors and update you with any changes from Friday. Finally, we will have a brief discussion on Saturday at 6:15 for general feedback and suggestions for future events. Staff / Event Coordinators: Coordinators will be stationed at the reception table in case you have questions or problems during the event. They’ll be wearing name tags / lanyards. Central Cashier: The City of Muskegon requires that all sales go through a single cashier and NOT through the individual authors. For details on how this will work, check here. More details will be provided during orientation. Display Items: Any items not meeting the family-friendly requirements for this event are not to be on display. Nothing can be taped or affixed to walls or pillars or glass. Central corridor tables (27-42) do *not* have space for displays other than table-top; authors in this area will have access to additional space in the Frauenthal lobby for easels and displays that do not require table-tops. Other author locations *may* have limited space for easels, etc. so plan accordingly. Tables & Coverage: You are responsible for setup and coverage for the full duration of the event which begins at 10 am and ends at 6 pm each day. Make arrangements with your fellow authors or staff for any brief absences for lunch, restroom, etc. Costumes: We’re encouraging authors to dress in costumes. Your theme could be a character in your book, costumes from your genre, or even costumes you think will attract visitors and interest to your table. It’s an opportunity to be creative, have some fun, AND win a prize. Yep. There will be prizes. Wireless Internet: We will have wireless service for authors & publishers during this event. Access info will be available upon arrival. Overnight Security: The theater will be open beyond the hours of our event. There’s a fancy nightclub expected to open this summer, and customers will walk through the Frauenthal lobby on their way to and from the nightclub. We’ve made arrangements for locked storage at the Frauenthal for anything you do not want to leave on your table or take away at night. Free Book Giveaway #1: You will be included in the book giveaway (once each hour during the event). If your book is chosen, the winner will hand you a winner’s voucher which you can redeem for 50% of the retail price of your book (we’ll pay you up to $10). If you do not want to participate, you must let us know before the event begins so we can exclude you from the drawing. Author Hunt Giveaway #2: Depending on the crowds, we will also offer an Author Hunt Giveaway to visitors. They’ll be given a ticket with the names of 5-6 randomly selected authors. The visitor must connect with the authors on their ticket, and get you to put your Author ID and initials on their ticket. Completed tickets will give them a second chance in the free book drawing. It’ll give you a chance to tell people about your books. Again, if you do not want to participate, you must let us know before the event begins so we can exclude you from the drawing. Marketing Effort: We will be conducting several marketing activities, and we hope you will be active in marketing the event as well. This is what we’ll be doing and what we suggest for you. Code of Conduct: All participants are required to abide by the Michigan Authors Code of Conduct. Cancellation / Refund Policy: We understand plans don’t always work out. After May 7th, there are no refunds are available. If you’re unable to attend, we would appreciate you’re letting us know as soon as possible so we can plan accordingly. Lodging: If you plan to stay overnight in Muskegon, we suggest booking your room early. Muskegon is a popular summer destination and last minute arrangements could be expensive. Some websites (in no particular order) you may wish to consider: Orbitz.com, HotWire.com, Hotels.com, PriceLine.com, Booking.com, Travelocity.com, Kayak.com, and others. More Info: If you need more info, please contact us.